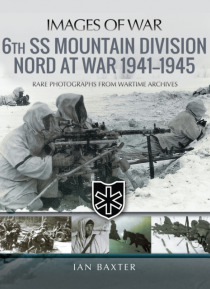 Drawing on a superb collection of rare and unpublished photographs the 6th SS Mountain Division Nord 1941 - 1945 is the 6th book in the Waffen-SS Images of War Series compiled by Ian Baxter. The book tells the story of the 6th SS Mountain Division Nord, which was formed in February 1941 as SS Kampfgruppe Nord (SS Battle Group North). The Division was the only Waffen-SS unit to fight in the Arctic … Circle when it was stationed in Finland and northern Russia between June and November 1941. It fought in Karelia until the Moscow Armistice in September 1944, at which point it left Finland. It suffered heavy losses in the Operation Nordwind in January 1945 and in early April 1945, the division was destroyed by the US forces near Budingen, Germany.